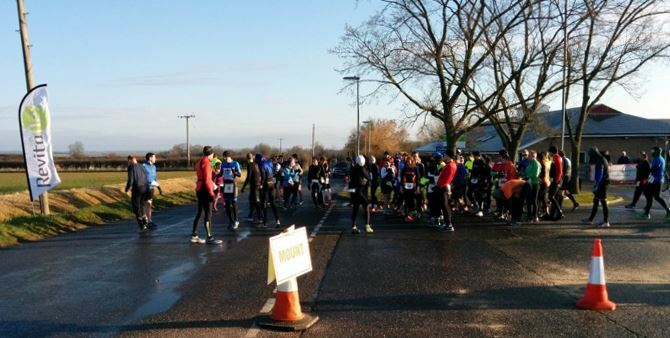 Cambridgeshire Raynet assisted at the duathlon organised by Monster Racing around Witchford near Ely, on 6th March 2016. The duathlon had approximately eighty participants and consisted of a 5km run, a 25km bike ride, and finally another 5km run. It was a cold and partly cloudy morning with a biting northerly wind and so our biggest fear was cyclists sliding off as there were some patches of ice on the country lanes. As it happened, however, everything went well and without major incident. We ran two nets, one amateur and one Simple UK PMR, from our new (and as-yet only part-finished) control vehicle, Flossie 2. 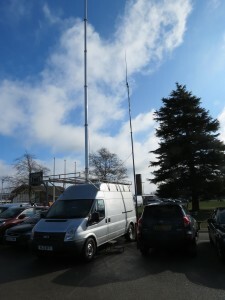 Like the original Flossie, which was retired at the end of 2015, the replacement is operated by Cambridgeshire Repeater Group and Raynet is one of several local organisations which share in her use. Marshalling duties around the course were shared by Raynet members along with Cambridgeshire Search and Rescue (CamSAR), hence the two different nets. 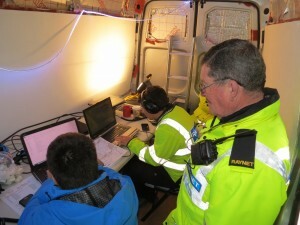 By having control for both nets in the same van, however, it was easy to pass messages between the two different organisations, which was particularly critical when we had to arrange the transportation of a rider whose chain had broken about halfway around the course. For this event, a sweep minibus around the cycle route was provided by CamSAR. This bus was fitted with an Iridium tracker, linked to the amateur radio APRS data network, so that we could map the position of the sweep, and therefore the last rider, from the control van. Another successful event completed, with all of the competitors accounted for safely at the end. It was also one of the smaller events we do in the year: the race having started at 8am, we were packed up by lunchtime.